Spend a day with Jeremy Sicile-Kira and you’ll meet the most amazing young man who, despite his severe autism, just wants to be like everybody else. Jeremy is 24 years old and non-verbal. He requires round the clock support, and I am one of his support staff. Jeremy invited me to take the AGI Online Residential/Daily Living Course, so that I could learn more strategies to support him better. I completed the 12-week certificate course in early November. It’s amazing now to see that I can actually implement what I’ve learned in class into daily activities with Jeremy. The hands-on implementation of the learning modules is imperative, and I share some examples below. Interacting with a speaking world can be challenging for anybody. But when it comes to Jeremy, he faces those challenges head on. Some examples of how we communicate include visual supports, such as picture cards, pointing, or using objects. In the online course, we learned a lot about various types of visual supports, and they appear to be the most effective and easiest strategies to use when I support Jeremy. In his household, for example, everyone uses a visual organizer. Always at hand are both his visual weekly schedule and his daily events plan. This chart is beneficial to Jeremy, because it is broken down into three sections. Each of these three sections are broken down into categories of 1) Things I Need To Do, 2) Things I Want To Do, and 3) Daily Schedule. Jeremy fills in the boxes of the things he’d like to do throughout the day, such as go to the beach or get fries at his favorite restaurant. Some examples of things Jeremy needs to do include getting dressed, brushing his teeth, making his bed, getting his backpack ready, and completing general chores at home. See photo (right): JameyLee reviews the daily schedule with Jeremy. One of the main things that I have learned so far in the course is that in order to have effective communication, Jeremy and I should have multiple ways of communicating with one another and those we interact with. Some ways to support Jeremy’s communication include letter boards, keyboards, and choice boards. All three of these methods are effective; however, because Jeremy does not verbally communicate, we can sometimes experience misunderstandings that lead to anxiety, anger, and meltdowns. Behavior plays a significant role in communicating. As Jeremy’s support person I must be a good observer and listener, and I must know how to respond to him. For example, due to his sensory challenges, Jeremy gets tired easily. If he lets me know that he’s tired, then he’s tired. In fact, Jeremy must depend upon all his support staff to listen to his comments and requests, even when they might not make sense to us. It’s also important for us to be patient and to allow Jeremy to finish his comments when he communicates with us, even if it takes a while for him to respond. Another thing I learned in the online course to support communication is that scripting can be beneficial whenever there’s a change to Jeremy’s daily routine. Any change in the routine requires advance notice to help prevent anxiety and the behaviors Jeremy experiences due to anxiety. If Jeremy gets anxious because of a change in routine or expectations, one strategy I have learned and used is to offer a choice of going for a walk or for a car ride. Both of these activities calm Jeremy. Another important thing I have taken away from the course is to eliminate my use of the word “don’t” when I interact with Jeremy, because he interprets this word as a negative message. For example, I used to remind him at the bathroom sink, “Don’t forget to wash your hands.” Now, when I replace this phrase with “wash hands,” he feels respected. Jeremy can be very adventurous at times. This can be both good and bad. Good because we want Jeremy to experience life just like any other person, but bad in the sense that Jeremy has sensory differences that can sometimes make him vulnerable. For example, I recently learned that Jeremy loves riding on the roller coasters at Disneyland. He loves going really fast to get the sensory input. But Jeremy doesn’t necessarily feel fear, which means he doesn’t know to hold on when it’s time to do so. In order to remind Jeremy to hold on, we must put our hands on top his on the safety bar. Another pleasant surprise I recently learned is Jeremy’s love for swimming. And again, because of sensory issues, Jeremy does not always know safety boundaries. For instance, if we were to take Jeremy swimming at the beach, he would likely swim far out beyond the waves and, essentially, keep going and going. In the online course, we looked closely at supporting a person with autism through their PINS, which stands for Preferences, Interests, Needs and Strengths. Knowing Jeremy’s love for water and for going fast, I wanted to introduce him to something completely new that would combine both his interests and strengths: jet skiing! 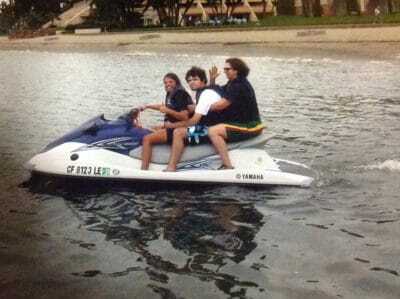 See photo (right): JameyLee, Jeremy, and his mom Chantal give jet skiing a try. The week prior to jet skiing with Jeremy, I did several things to prepare him for this adventure. Drawing on what I had learned about using visual supports in the online course, the first thing I did was share various photos of jet skis with him, so that he could see the different types of jet skis and become familiar with them. Secondly, I created a task analysis for going jet skiing and gave it to Jeremy to study so that he would have a complete understanding of what we were going to do step by step. Once he understood the task analysis, we went over the rules about being on the dock, the rules of the water, and the rules on the Jet Ski. Then, we headed for the ocean. We put on our life jackets and boarded the Jet Ski. Jeremy has vestibular and proprioceptive challenges. These are the important internal sensory systems I learned about in the online course. They inform our awareness of where our bodies are in space, not to mention our sense of equilibrium. To address his sensory challenges, an additional person, Jeremy’s mother, rode with us on the Jet Ski. We sandwiched Jeremy between us to support him and prevent him from falling off. I was the driver of the Jet Ski, Jeremy was directly behind me, and Jeremy’s mom was on the back. Because Jeremy is non-speaking, I had to come up with a system for him to be able to communicate with me while we were in the water. 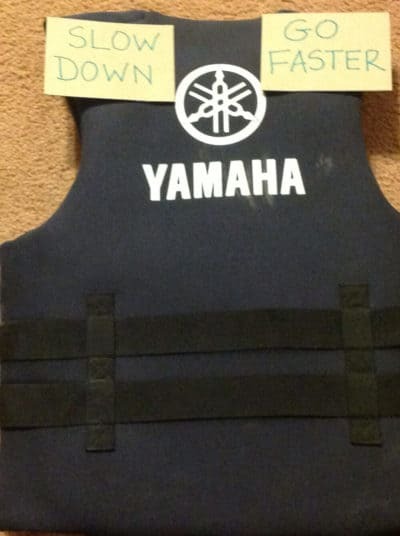 So, I created another visual support by laminating two signs and attaching them to the back of my life jacket. On my left shoulder I attached, “SLOW DOWN.” If Jeremy wanted to slow down, he would simply tap my left shoulder. My right shoulder read, “GO FASTER.” Likewise, if Jeremy wanted to go faster, he would tap my right shoulder. See photo (right): This is the back view of JameyLee’s life jacket with communication cards for Jeremy. This system gave Jeremy the opportunity to feel more in control of the situation, which in turn lessened his anxiety in this wonderful adventure of trying out something new and doing things he loved! My overall impression of the online course is that it contains a wealth of knowledge. I’ve learned quite a bit in just a short amount of time both in the assignments and in the class discussions with the instructor, TA and my fellow learners. I would highly recommend the course to all those who are interested in supporting those who have autism. JameyLee Nuss is part of the residential and community support staff team for Jeremy Sicile-Kira.